Wednesday Feb, 26th 2014 Update: Friday Oct, 15th 2015 Our Illusions Must Welcome Truth, Be Spoken With Love, And An Honest Reflection Of Faith In Order To Manifest Freedom For An Ever Expansive Eternity. Hello my lovely and beautiful friends. Let this Poem of Twin Star Synergy be as a divine reflection upon all Twin Flame Pairs settling in magnetic alignment to help reshape our entire creation in this Living Prayer of Mother Gaia's current shift to remain so to continue so in Grace and beauty without danger to those incarnate within her. I wrote this in an appeal to my brothers as they had been reluctant to receive my unconditional love within my intentions of divinity in grace and humility. I still think it can reach so many others as it came through my SOUL HEART(Higher Self) and my Highest GOD Self and of course the Light of my Twin Star Jophiel. ILLUSIONS Too long are your day in Linear Time I am speaking to them that there are more timelines available to us to choose from such as taking ownership and accountability for all that we have been, all that we are and all that we might become, then becoming the very best Divine Intentions of our future selves and anchoring that there within our present being. So steep is the slope on the mountain side I am speaking about how our perceptions of what we might become can be so difficult to face, because we can tremble in fear of truly embracing our youth; both our Cosmic youth and our incarnate youth. There are so many ways to heal and so many feel that facing our past is a scary thing, but it is the very best way to recall our angelic history and to heal and protect the very nature of our upbringing. I know we must protect that which we are, that which we have been in order to become that which we truly intent to be by the Grace of our most Highest and Divine Intentions. Too bright is the light in the Truth I shine Please don’t take this as arrogance, dear brothers and sisters. I do indeed carry such high vibrations of Light within my BEING, but I don’t do so in to mock and ridicule others. These past few months have been about research into expression myself in infinite and unconditional love as my Light must always be accompanied with that Love. Here I am living here with you and among you. Please hear my Living Prayer and embrace my Hearts SOUL SONG. I am your brother and I love you so very much. So hidden in your comforts of a false design This was my growing frustration in which I had spoken for hours and hours, days on end reaching so many souls in deep meditation only to fall short in reaching my closest and dearest brothers. This is what I mean about when we fall into false programming and forget to truly embrace our darkness and to love that which we fear the most. TRUTH What more is created by waiting than time? I’m talking about “complacency” here in which it seemed so many sit around waiting for things to happen when we can be always in our “Living Meditation” which is based on our incarnate BEING and our “Living Prayer” which is based on our divine intentions and our infinite love. More of the same; stagnation and separation inside Quite obvious here as I’m referring to what happens when we sit and “wait” –nothing, but being in fear of our growth when we should be focusing on the very best intentions of ourselves, our future and that of all others. God’s Dream and Your Dream and the same as mine It’s too easy to get caught in the hype or idea of everyone having their own “truth” but in our highest divine intentions, there is only ONE TRUTH; ABSOLUTE TRUTH and that is being in our Grace and Love and Light. While in an honest reflection of one’s Sacred Mind Please stay in honesty, reflected curiosity and wonder, question everything and think objectively, because that is how we come into our wisdom of experience, by walking the path of knowing. LOVE How great that heart within you could find? Of course, I’m speaking about the heart we can build within ourselves and the threefold flame. The Cosmic Blue, full of Wisdom of the Divine Father. The Cosmic Rose, so full of Nurturing of the Divine Mother and the Golden Glow of Freedom incarnate. <3 No longer clinging to a Spiritual Duality Everyone knows the ego self, but there is a spiritual ego as well and a duality between the Mental/Conscious selves and the SOUL HEART/SPIRITUAL HEART. This is the separation of ones brilliance, infinite love and very SOUL SONG. Such abundance and golden light will fill inside When we can bring our enlightened divine intentions down through our SOUL HEART(Higher Self), we gain the potential to fill our Incarnate Self with a Golden Huge of freedom. All hearts will become an Eternal Star of Time What is “time”? It is relative, isn’t it? Relative to space, all that is, all that might have been, has been, will be, could be and will become. Becoming an Eternal Star of Time is what all souls alike become as we all GOD, experiencing GOD as GOD. FAITH The God that is you wants to participate in Life Let us truly embrace the Light of GOD WITHIN us and reflect this throughout ALL THAT WE ARE, all that we might become and all others alike as an empowerment of our Divine Intentions, both from the Mother and the Father alike. The Light that you are will stop all pain and strife The constant healing that we receive so long as we are in FAITH brings us to shed cleansing tears, releasing all burdens just as laughter will heal all wounds. Let the Wisdom of the Father take you to new heights The light that is infinitely above is the Wisdom of all that has been experienced. Let the Divine Father protect us as he guides our divine intentions And embrace the Mother within and make her your wife I’m speaking about the marriage and balance between the masculine and feminine such as the left and right sides of the body and the light above and the physical incarnate being. FREEDOM For we are all the Mother and the Father alike With the Threefold Flame marriage in sight The incarnation of one’s Divine Intentions Ignite An honest loving expression of eternal delight More about the balance of the Threefold Flame which is the Divine Masculine and the Divine Feminine birthing in the Golden Glow and Holy Trinity of Humanity of which when truly embodied, the Divinity of both Mother/Father GOD and the Love and Light that is ones Awareness, this truly IS the embodiment of our GOLDEN, “Eternal Delight” ETERNITY With our wings wide open and our hearts ever pure We earn our GOLDEN LIGHT as this is our LIGHT incarnate in UNCONDITIONAL LOVE. This Golden Delight is our Living Meditation, it is our Divine Intentions living incarnate and it is the very love and light of MOTHER/FATHER GOD that grants us our WINGS. 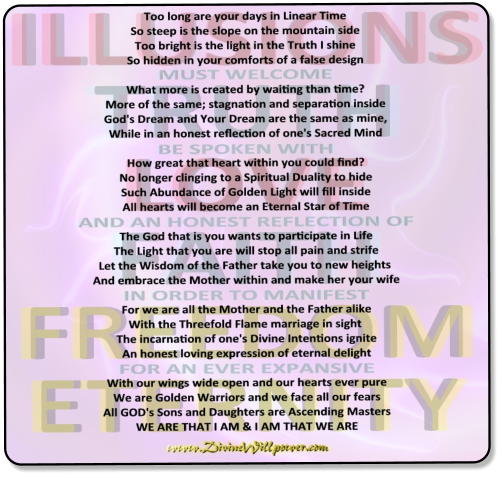 We are Golden Warriors and we face all our fears Becoming “GOLDEN WARRIORS” is my dream for ALL Humanity as we gain our wings, but this only comes to us as we truly love that darkness that we truly are, WITHIN us and THROUGHOUT us. This is what I keep talking about when I refer to “GOD’S DREAM” my brothers and sisters. All GOD’s Sons and Daughters are Ascending Masters GOD stopped creating angels so long ago. We are here now to become angels.. We ARE all “EARTH ANGELS” my beloved Sons and Daughters of GOD, but this is not something that is simple given to you. This is not a gift either. It is earned through FAITH and LOVE of which is of infinite supply so long as we truly remain in the GRACE OF GOD. What is a “Master?” A master is someone who is always a student. 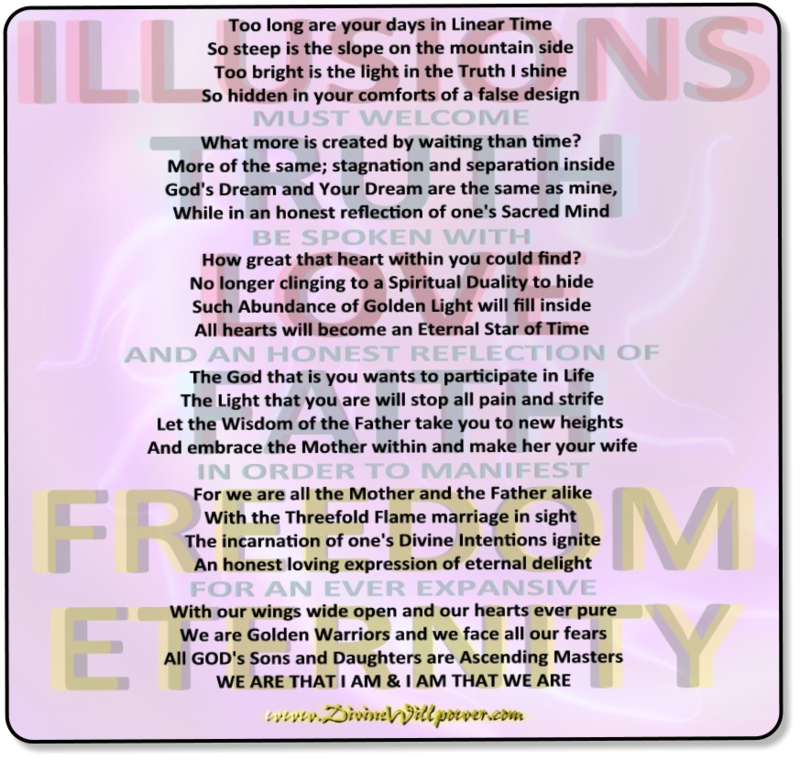 WE ARE THAT I AM & I AM THAT WE ARE Let our Hearts shine as ONE! <3 I love you all so very much. I am your brother, here with you loving you with my highest intentions of Divinity. Jacob ♥ Jacob Please consider “Sharing” this page with your friends and family. Or you can “Like” Divine Willpower at the top of the page. Ownership Continued - Togetherness Is The Solution! The Holy Trinity IS Everywhere! Past Life Regression OR Past Life Stagnation? We're Born Consciously Aware of ALL THAT WE ARE - Where Did It ALL Go?! Ascension, Disclosure, First Contact - When? Turning Prayer Into Action! - Gifting Our Children With Truth! Become the Creator Being of ALL THAT YOU ARE and ALL THAT IS! Loving the "Dark Ones" of the Cabal!?!?! Follow Your "Feelings" to Find Your "Knowing" & "BE" ALLTHAT YOU ARE! What Is Truth? What Is Awareness? How Do I Get There? Owning the Playing Field of Kindness - Manifesting The New Earth Sun! What Is "Thymus Tapping" Really?! Is The Light of GOD Infinite? What Is LOVE and LIGHT? Our Karmic Field - What Is Karma? Advanced Meditation of Unity Consciousness - The "New YOU Attunement"